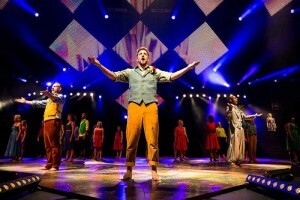 Love Beyond is a new musical, telling the bible story from start to finish. Written by Richard Haley, it premiered this month in Brighton. South East based TSL Lighting were approached to provide lighting equipment and design, rigging and LED screens for the show. The company also provided custom content creation and an integrated show control system for the production. TSL Lighting's MD, Sam Tamplin, commented: " We have recently added the M-Box Media Server to our rental stock and this show was our first opportunity to use two of our systems on a high profile production. We have used an MA network to trigger lighting and video cues and also sound cues and the band click track via the M-Box. This show has been especially effective for us, as we are also preferred technical suppliers at the Brighton Centre, where the musical's debut was staged." Producer Richard Haley added: " TSL have been an ideal creative and technical force in the staging of Love Beyond." The show is planned to tour the UK in 2014.